to the way the seven planets revolve around our sun. Living beings inhabit these worlds." 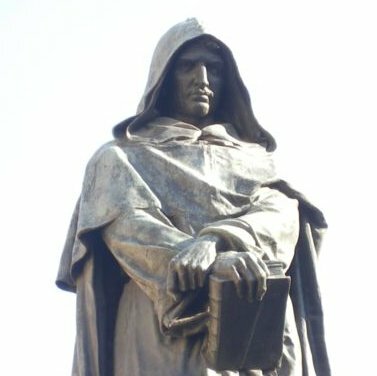 "An academician belonging to no academy", an unfrocked monk, an excommunicated Calvinist, an expelled Lutheran, an avant-garde and marginal philosopher, a forgotten genius of the Renaissance - Giordano Bruno was also an inspired magus. 1 - The statement of "two real and eternal principles of existence: the soul of the world and the original matter from which beings are derived". 2 - The doctrine of the infinite universe and infinite worlds in conflict with the idea of Creation: "He who denies the infinite effect denies the infinite power". 3 - The idea that every reality resides in the eternal and infinite soul of the world, including the body: "There is no reality that is not accompanied by a spirit and an intelligence". 4 - The argument according to which "there is no transformation in the substance", since the substance is eternal and generates nothing, but transforms. 5 - The idea of terrestrial movement, which according to Bruno, did not oppose the Holy Scriptures, which were popularised for the faithful and did not apply to scientists. 6 - The designation of stars as "messengers and interpreters of the ways of God". 7 - The allocation of a "both sensory and intellectual" soul to earth. 8 - The opposition to the doctrine of St Thomas on the soul, the spiritual reality held captive in the body and not considered as the form of the human body. Summary of the Trial Against Giordano Bruno, Rome 1597: From the Vatican Archives. Blackwell, Richard and de Lucca Robert, eds., 1998, Giordano Bruno: Cause, Principle and Unity and Essays on Magic (Cambridge University Press). Bruno, Giordanao (translation by Arthur Imerti, 1964), The Expulsion of the Triumphant Beast (University of Nebraska Press). Gatti, Hilary, 2010, Essays on Giordano Bruno. Riehl, Agnes, 1889, Giordano Bruno: In Memoriam of the 17th February 1600 (translation by Agnes Fry, 1900). Rowland, Ingrid D., 2008, Giordano Bruno: Philosopher/Heretic (University of Chicago Press). White, Andrew Dickson, 1896, The Warfare of Science with Theology in Christendom (New York: D. Appleton & Company), 1978 reprint. The statue of Giordano Bruno, unveiled on 24 June 1899 despite objections from Pope Leo XIII, still adorns the Campo dei Fiori in Rome to this very day.